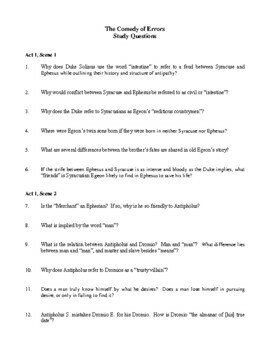 The Comedy of Errors Study Guide contains study questions for each act and scene for the play by William Shakespeare. 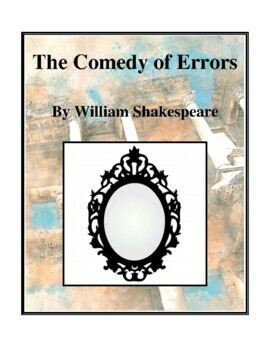 Even though The Comedy of Errors Study Guide contains study questions, it has been primarily developed for a more project-based study of the play. 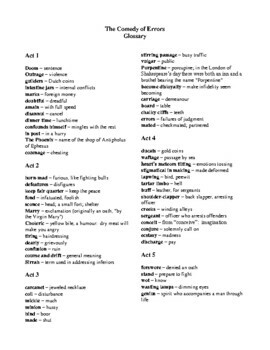 The following titles are included in the study guide: Glossary, Character Profile, Themes and Motifs, Who's Who?, Abuse and Violence, Evoking Comedy, Genre, Twins I Know, Word Search, What Did He Say?, Who Said That? (& Key), Quiz (& Key), Alert the Media, A Letter Learned, Cluster Web, Concept Map, Using One's Senses, Word Web, Antipholus Twinned, Book Cover, Character Collage, Finding Your Twin, Imagery, Letter from Emilia, Mapping the Mediterranean, Play Poster, Secret Twin, Who Are You?, Knowing Yourself through Poetry, Luciana and Adriana, Point of View, Punning Man, Signs, Your Sign, The Party Speech, Map Making, Travel Journal, What's In a Name?, Themes, Storyboard, Travel Reporter, Multiple-Choice Quiz (& Key). 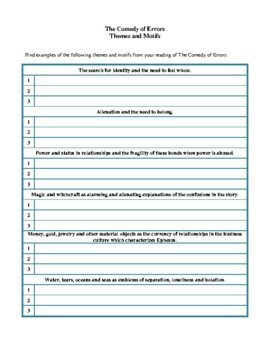 An Answer Key is provided for Who Said That?, Quiz, and Multiple-Choice Quiz.